74 MMS December 2016 mmsonline.com FEATURE aluminum or titanium, these units' carbon fiber construction is designed to provide a combination of stiffness, light weight and thermal stability that Mr. Donovan says is particularly critical in long- reach applications. As for the probes themselves, Tube Hollows tends to favor silicone nitride tips over the more common ruby ones, which wear too fast in Hastelloy, molybdenum and other hard materials, Mr. March says. Gage repeatability and reproducibility (R&R) studies are critical to minimizing measurement uncertainty with these long styli, Mr. March adds. As for process planning, Calypso sof t ware's Navigator wizard helps greatly in zeroing in on the proper application parameters, he says. With st ylus systems configured and programming complete, operators qualify the probe by scanning the same portions of the reference sphere at dif- ferent force levels. Known as tensor qualification, this procedure determines precisely how much the stylus will bend per unit of force. Guided by the program, the CNC and sensor feedback, the internals of the head do the rest. 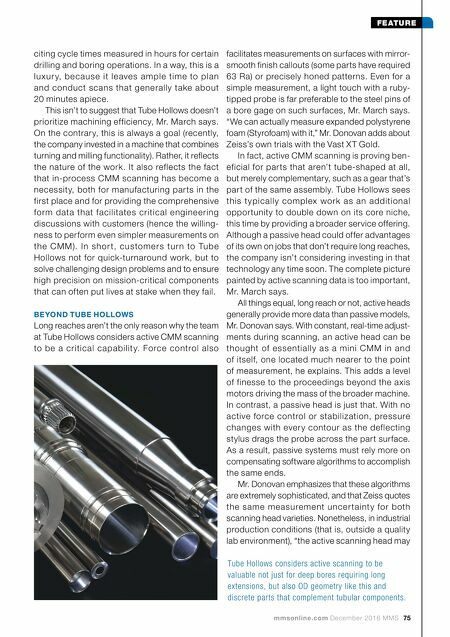 Tube Hollows' metrology procedures can be considered "active" in a broader sense than the company's choice of scanning technology. The CMM sees a great deal of activity from job to job because production of newer, more complex par ts is a constant relay between the quality c o n t r o l a r e a a n d s h o p f l o o r, w h e r e a c t i v e scanning data guides every phase of the process. As an example, sales manager Evan Spoerl cites a recent job that involved precisely locating a critical radius at the transition bet ween t wo ID diameters in relation to a particular point on the OD. In this particular case, pulling the part for of fline inspection verified that the boring bar had reached the proper depth. However, s u c h s c a n s of te n reve a l th e n e e d fo r s l i g ht process adjustments. So the process goes, step by step and often amid ongoing back and forth with the customer, until the time comes to prepare a full inspection report. At that point, the lion's share of necessary data has already been collected, Mr. March says. This saves some measure of time, but it hardly makes up for the fact that in-process inspections require additional setups away from the shop floor between operations. 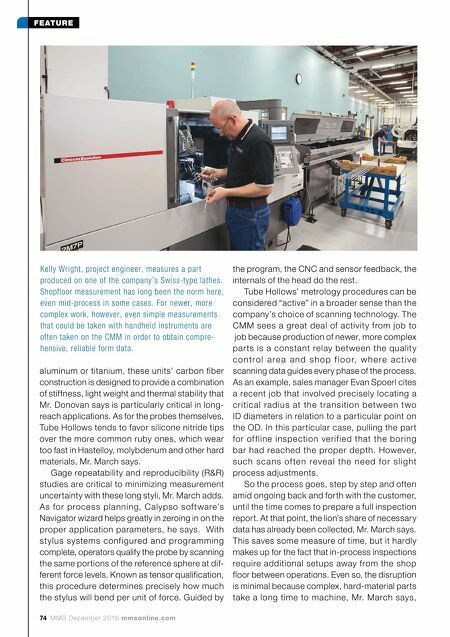 Even so, the disruption is minimal because complex, hard-material parts take a long time to machine, Mr. March says, Kelly Wright, project engineer, measures a part produced on one of the company's Swiss-type lathes. Shopfloor measurement has long been the norm here, even mid-process in some cases. For newer, more complex work, however, even simple measurements that could be taken with handheld instruments are often taken on the CMM in order to obtain compre- hensive, reliable form data.